Menu: This is all you need folks! If you need some protein, just add some chopped cooked chicken and you got yourself a one pot meal. So, I made this months back and just getting around to posting it now. 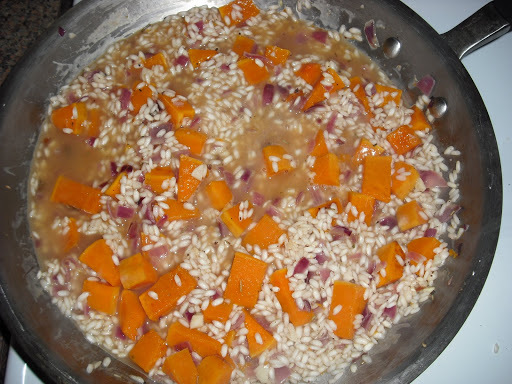 Here’s how it went: I had a butternut squash, some Arborio rice and no idea what to do for dinner. There was 3 inches of snow on the ground and hell if I was gonna walk to the grocery store for dinner. We make risotto quite a bit. Risotto with cheese, peas, asparagus, meat, you name it we have made it. Except for butternut squash. I know, I know, this is a popular combo, but I had not made it quite yet. I always start risotto with onion. And when I saw the lone red onion, I thought, “Oh, No.” Red onion in risotto…how un-elegant. But it was all I had (and again, damned if I was gonna go to the store). 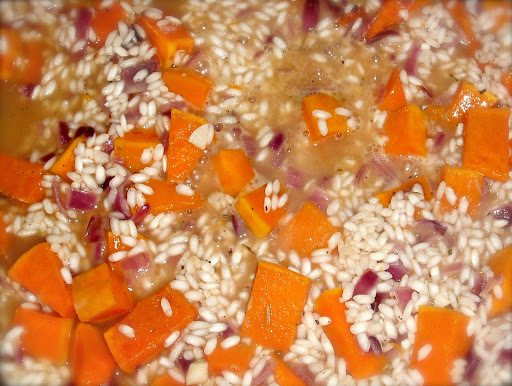 So, I began my butternut squash risotto with red onion. A wonderful creation emerged, just for my brister 😉 So, here you go Joey. When you meet that special lady and she doesn’t believe your total and utter obsession with Clemson (I don’t think that this is a hard concept to get as all she would need to do is be in the room while watching you watch a Clemson sporting event…ANY sporting event…even a gymnastics competition would do…) just make this for her. Actually, scratch that. She might run the other direction when your meals start to resemble Clemson, too. So, Joey, this one is just for you. And maybe, just maybe, one day we’ll be in the same state long enough for me to make it for you, bro. Cut butternut squash lengthwise into two pieces. Scoop and seeds and membrane. Peel (not as easy as it sounds, people, make sure you have a good peeler or you’re in for a long peeling). Cut into 1 1/2-inch pieces. Place squash on baking sheet and drizzle with EVOO and S & P. Roast for about 12 – 15 minutes until lightly browned, turning once or twice. Remove and set aside. Heat large skillet over medium heat. Add EVOO and then add onion once you can smell the oil (this means the oil is heated through). Saute onion for 5 – 8 minutes until translucent, but not browned. Add garlic, S &P, and thyme and saute 30 seconds until fragrant. Add rice and constantly stir for about 2 minutes, The rice grains will become clear on the outside. Deglaze pan with wine and cook until almost all liquid has evaporated. Add about 1 – 1 1/2 cups of chicken stock – enough liquid to come to the top of the rice. Stir and let liquid cook down. Repeat this process: add liquid and stir in. Cook down until liquid is almost gone and add more. Continue this process until rice is done: soft and velvety, not chewy – about 25 – 35 minutes. Serve in big bowls with parmesan and parsley to top. This entry was posted in risotto, Vegetarian by callywoodfarms. Bookmark the permalink.